Doosan’s BWC 33 Center Controlled Rider can make picking orders safer and more productive. The BWC33S-7 Center Control Rider can double as a transporter and a low level order picker, freeing up more expensive equipment. By placing the operator’s compartment in the center of the truck, your operator is in a safer, more protected environment. Eases entry and exit of vehicle. Helps to stabilize operator and load in turns and sudden stops. Turns off truck and applies brake when operator exits truck. Alerts other to your presence for safer operations. Reduces fatigue and makes maneuvering in tight spaces much easier. Absorbs shock and applies the brake when the operator exits on either side of the truck. Handy compartment for out of the way storage. 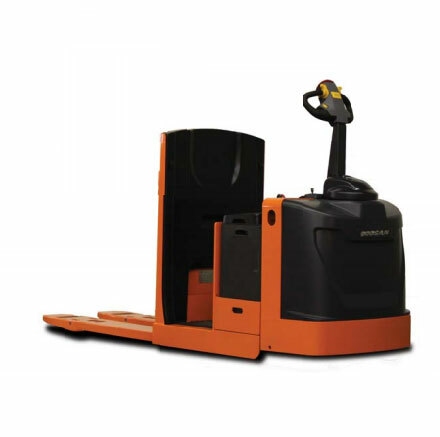 Coast Control is an orderpicking mode that allows the truck to coast a short distance to position the pallet behind the operator when handling product. Urethane cushion floorboard delivers superior comfort to the operator. Doosan powered warehouse vehicles come standard with an Hour Meter/Battery Discharge Indicator to keep track of hours used and reserve battery power at a glance. For loading and unloading a replacement battery from either side. Curtis solid state controllers provide smooth acceleration and seamless directional control. Its Regenerative Braking feature adds energy back to the battery to improve efficiency. With AC Power, you will benefit from faster acceleration, more torque, higher efficiency, and lower maintenance costs due to the brush-less design.